Those who have a passion for children and enjoy working with them on a day to day basis, but who don’t have the desire or qualifications to be a teacher, often turn to a career in childcare. Childcare workers have fewer qualifications and requirements than teachers, but still get to use their abilities to care for the needs of children. A childcare worker is in charge of the care of children when parents or other family members are not available to do so. They will feed, play with, bathe and otherwise care for the children. Sometimes they will do some basic preschool with the children or help school-age children with school work. Their primary job is maintaining the health and safety of the children when the parents are not around. The role of childcare worker does not have specific qualifications or requirements. A childcare worker can be as simple as a babysitter hired to care for children in the parents’ absence. However, those that choose to work in daycare centers or run home businesses in childcare will need to ensure that they meet all state requirements and licensure regulations. This may mean a high school diploma or equivalent. Childcare workers looking for certification may need to complete some college training in early childhood. Nannies and babysitters, however, are not regulated by state educational requirements. Those who pursue a career as a childcare worker typically finish high school, then pursue some training in early childhood. An associate’s degree is considered the primary college level degree for workers in this field who are going to work in a professional childcare center. As of 2013, the Bureau of Labor Statistics indicates that all workers in a Head Start program must be enrolled in an associate’s degree program or have a child development credential. Those interested in becoming childcare workers need to first determine the type of childcare they wish to provide. If their goal is to provide care as a nanny or babysitter, there are no particular steps to follow. Nannies simply need to advertise their services, interview potential families and start working as a nanny, although the International Nanny Association recommends first aid and CPR training. For those interested in starting a daycare in their home, the first step in the process is learning what licensure requirements the state has for home daycares. Once the licensure requirements are met and the home is set up appropriately for a daycare, they can begin advertising that they have daycare openings. 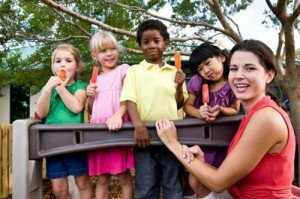 Finally, those who are interested in becoming a childcare worker in a center need to pursue first a high school degree or equivalent then an associate’s degree or professional diploma. Many centers will allow workers to start before they have achieved a degree, but some states require that these workers at least are enrolled in a degree program. As long as there are children and parents who work, there will be a need for childcare workers. The Bureau of Labor Statistics expects to see a 20 percent increase in the demand for childcare workers from 2010 to 2020. This is higher than the expected increase for all occupations. Those who have pursued formal training in childcare and child development will have the best opportunities for growth, especially as older workers leave the workforce. Pay for childcare workers is not the highest, but it’s also not the lowest. In May of 2010 the Bureau of Labor Statistics states that the average hourly wage for a childcare worker was $9.28. Those in the top 10 percent earned over $14.08. Those working in a formal daycare setting tend to earn more than those working as babysitters or nannies privately. Childcare work can be highly rewarding. It requires commitment and a high level of energy, but for the right people, a career in childcare offers the chance to be around children every day, which is its own reward.